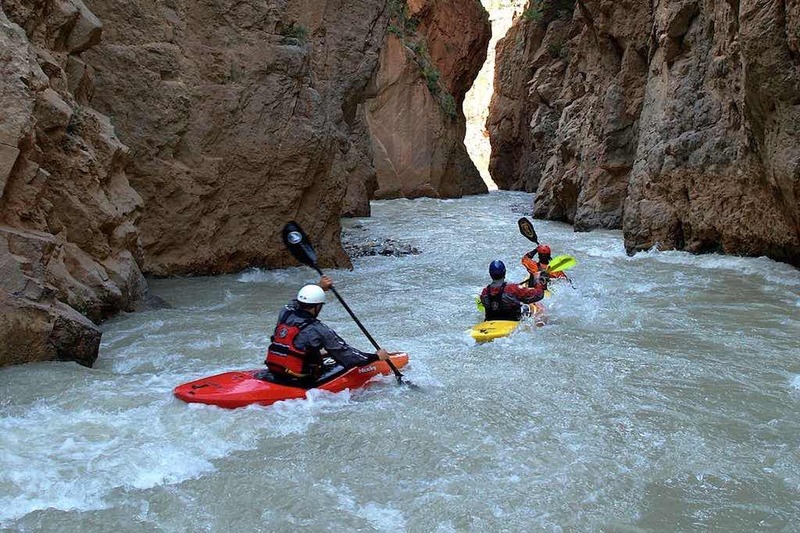 Morocco is home to some of the most exciting kayaking and river rafting opportunities in the world thanks to the rivers that snake through the mountainous regions, even though this remains a closely guarded secret. The valleys become gorges on the outskirts of the arid land; sun-dried mud houses grip the cliffs where children laugh and play. 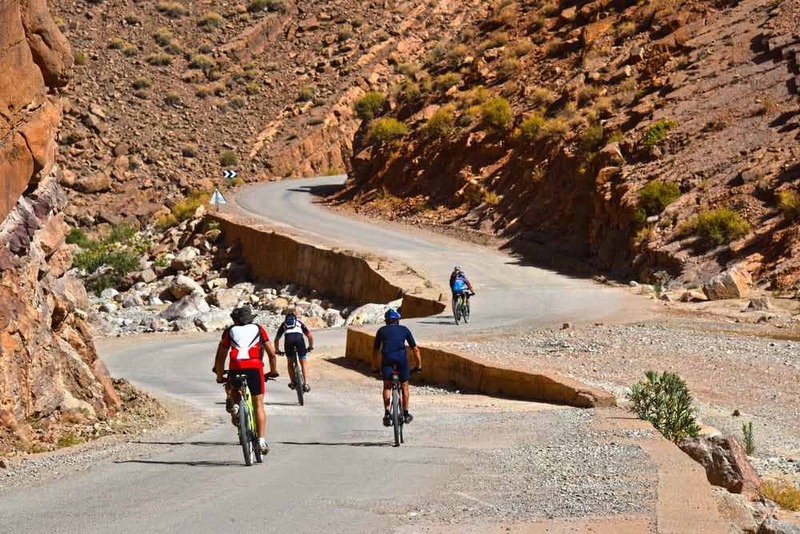 Winding between the waterways proves itself to be an incredible adventure for those wishing to become one with the nature of Morocco through some intense action. Taking a kayaking trip down a Moroccan river offers incredibly picturesque scenery beneath the perennial Moroccan sun. Much of these kayaking and rafting trips begin with the Ahansal River. The majestic Ahansal River pass down through the High Atlas Mountains and channel down the narrow path. When the two bodies of water meet is where the crowds can enjoy tending days of the best kayaking in Morocco. Kayakers and rafters will be flying by the seat of their pants during certain parts of the rapids that leave you battling with the water. Your hard work will be rewarded with a few seconds of downtime before reaching the next set of rapids, which is usually how river rafting works in Morocco. The day spent kayaking comes to a perfect end as you set up camp in the riverbed and enjoy dinner with your friends cooked over an open fire. Another great but unknown kayaking spot is the Lala Takerkoust reservoir. The reservoir is framed by the Central High Atlas Mountains, halfway down the High Atlas Mountains. Beginner kayakers typically choose to practice and learn techniques in this spot before moving further downriver. This spot is also convenient thanks to being around 30KM from Marrakech. As the kayaking adventure comes to an end, sightseeing goes beyond the river. Marrakech has some thrilling elements to offer visitors. Kayakers can travel through the Moroccan market souks and do some shopping, or rest and relax their sore muscles with a spa treatment and Hammam massage. 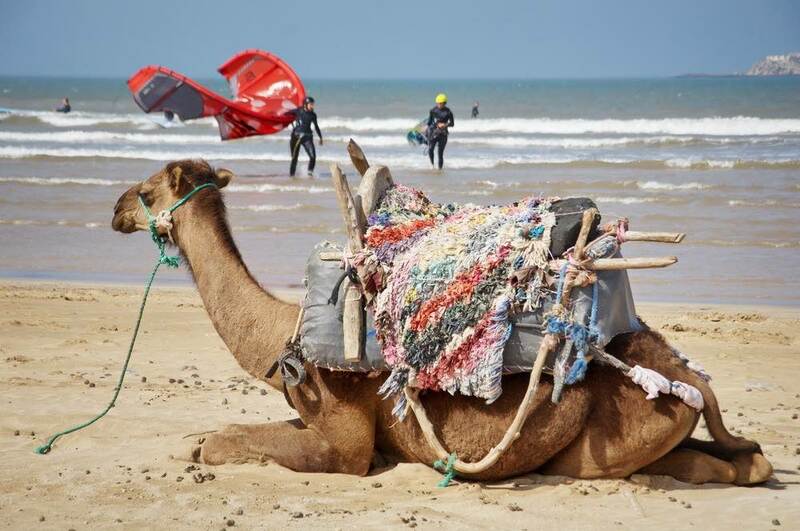 It can take between 3 and 10 days to make your way down the rivers of Morocco. 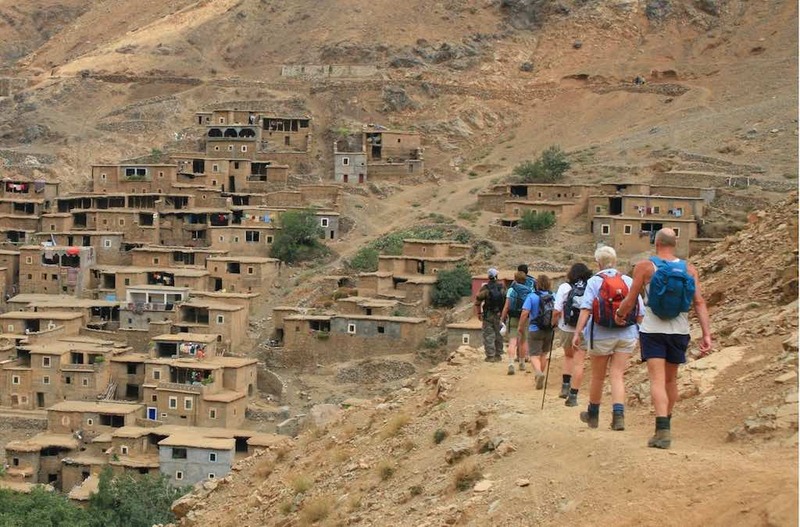 Many Moroccan tour operators suggest taking guided trips along the Ahansal River. The price for the trip includes the cost of equipment, meals, and snack for the trip. The camping gear needed for staying overnight at the riverside could be rented if needed. Kayaking in Morocco begins with meeting your travel guides in Marrakech. The travel guide will be the eyes and ears of a tour group as they move down the river. Most tours of Morocco include travellers spending the night in hotels to rest and relax before moving out again the next day. 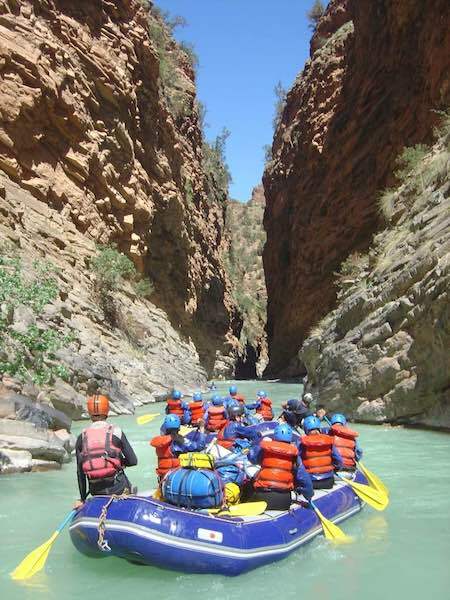 Some Moroccan river rafting and kayaking include trekking through the Atlas Mountains. This could be needed to make it to the launching point of the next day. Sometimes the rapids are too dangerous or lack the depth needed to travel along the water. It’s not always the case though, and may not always be a necessity. Kayakers and river rafters will receive more classes on what to do during an emergency on the third day. Emergencies include flipping over and corkscrewing. Tour guides make things even safer by teaching kayakers how to execute these safety techniques using paddles or other equipment in calmer waters. After a safety lesson, kayakers and river rafters will be ready to get moving on the river rapids. This includes taking a journey through Tiluquite where tourists have their first overnight camping stay. Enjoy Moroccan hospitality through prepared meals from the travel guides as you travel down the river. Kayakers spend the next few days experience the twists, turns, and adventures of the rapids. One of the more memorable parts of the trip will be travelling through the gorges near Lake Bin El Ouidane. Everything unfolds under the beautiful Moroccan sun during the day and the stunning stars at night. The best time to kayak a Moroccan river would be anytime between the beginning of January and the end of March. It’s during these times where the rivers truly reach their peaks. The rugged mountainous backdrops give way to stony riverbeds, combining the elements to create a truly magnificent Morocco whitewater rafting and kayaking adventure you’ll never forget. There are many great things to enjoy about kayaking in Morocco, but one of the best is that it offers some rest and respite from the more boisterous aspects of the Moroccan holiday. The kayaking season also affords a much-needed break from the cold winter for adventure enthusiasts. Perhaps the best way to experience Morocco is through taking a great kayaking trip through the waters of the country and seeing untouched villages dangling from the cliffs.